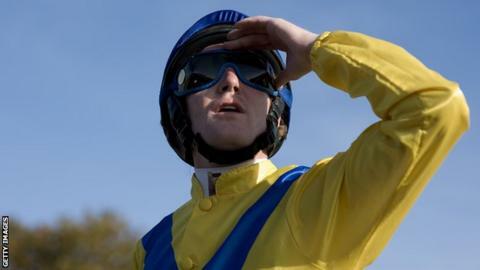 Jockey Pat Cosgrave has had a six-month ban for 'improper riding' reduced to four months by stewards in Dubai. Cosgrave, 31, was sanctioned by the Emirates Racing Authority for his ride in the Jebel Hatta on 8 March. But the Professional Jockeys Association (PJA) criticised the decision to uphold a ban, calling for it not to be applied in Britain. "We believe the board has seriously erred in its judgement," said PJA chief executive Paul Struthers. The jockey, who hails from County Down, won the 2008 Nunthorpe Stakes at York on Borderlescott and was a Royal Ascot winner on Society Rock in the Golden Jubilee Stakes in 2011. "As a result we will today be lodging an application on behalf of Pat Cosgrove with the British Horseracing Authority (BHA) requesting that they do not reciprocate the suspension." Northern Irishman Cosgrave was ruled to have moved his horse Anaerobio's line to allow stablemate Vercingetorix a clear run in the Jebel Hatta. The British Horseracing Authority (BHA) said that, under its rules, the suspension would also apply to Britain should the Emirates Racing Authority (ERA) make such a request. After the initial ban, the BHA said that the ERA could not make that request until the jockey had completed the appeal process. Struthers added: "While we are well aware that Australasian stewarding is different in style to European stewarding, and that their rules are not always the same as ours, some of the behaviour and processes that we witnessed fell far below the standards one would expect from a fair and reasonable regulator. "The result is that we have serious misgivings about the Rules and Stewarding in Dubai and do not believe that jockeys can be assured of a fair hearing." Vercingetorix won the Group One race and Anaerobio finished third.